Want to learn how to play backgammon wherever you go? You are in luck! 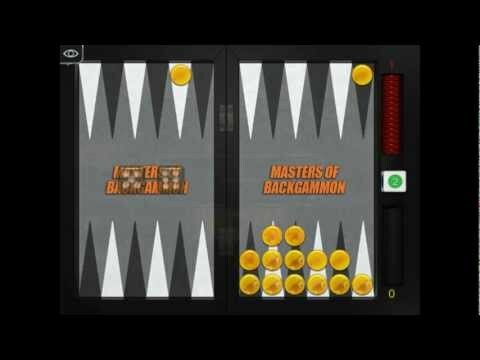 Backgammon Masters is an aesthetically pleasing game for online and single player backgammon. Enjoy the ancient board game in crisp, modern graphics on your smartphone or tablet! All board game fans will appreciate the easy to use interface, detailed visuals and many features. There is something for everybody! You can personalise your profile, challenge online players, make bets, gammon opponents, participate in tournaments, chat live, find new friends and learn all the tricks of this ancient and exciting board game! Want to play with friends and family? Easy! Play with your friends in hotseat mode, via bluetooth, organise tournaments and improve your skill! Out on a trip and have no internet connection? Just challenge our AI in any backgammon style you wish! One match will take you only 5 to 30 minutes. » Classic backgammon - the core of the game. » Narde (Nardi) - very popular in Russia. Longer play, since you can't hit opponent's checkers. » Tavla (Tavli or Turkish Backgammon) - popular in Turkey. Very similar to backgammon with some rule differences regarding checker play. » Nackgammon - variation invented by Nack Ballard with 2 differences from the original game. » Old English Backgammon - a style popular in United Kingdom. Despite the game's old age millions of people all around the world still enjoy this fantastic board game and its variations up to this day. Join and become a true Master of Backgammon! ● 6 beautiful boards: Classic, Metal, 10,000BC, Profi, Casino and White Crocodile! ● Share your success on Facebook or Twitter! ● Find new friends and opponents in global chat! ● Elo score support and skill levels for players. Can you reach the top? ● Free and regular updates! ● Collect daily free bonus coins! ● Multi language support: Russian, German and Turkish translations! ● Cross platform support for devices all over the world - Android, tablet or iOS, iPhone and iPad! If you enjoy Backgammon Masters, leave us a rating! We listen to our players and work constantly to improve the game and make it better. - Added 6 amazing emotes! Share your feelings during the game with the opponent! - Added wonderful stickers to boards during tournament games to reflect the Holiday spirit! - Game chat now works only in a friendly match. For regular games players can exchange quick phrases. - Adding of friends now takes place through chat. Added additional function to add friends via invitation link and receive gold for invited friends. - Tourney prize winners get reward instantly.